Axial flow fans are intended for drying wood and operating under conditions of high temperature (100 °C) and high humidity (100%). Fans of this type are characterized by high increase in static pressure at low rotational speed and are used in modern drying chambers. The so called reversible fan rotor was specially adapted for both directions of rotation, i.e. clockwise and anti-clockwise. The maximum operating temperature for high temperature fans is 100 °C. 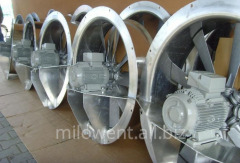 Unbelievable price on Drying chamber fans in Chelm Slaski (Poland) company Milowent, S.C..